Upon entering, a visual interplay of harmonious browns and whites complement the Ikebana floral arrangements. The sushi counters, made of premium Hinoki wood from which Emperors’ palaces and caskets were built, set a sophisticated tone. Behind the counters, chefs fervently chop away on cutting boards made from superior Japanese Cyprus. Chefs Yuji Yabe and Hiroki Sodou, who have earned one Michelin star for the Sushi Ichi branch in Tokyo (Ginza) have an eye for detail, right down to the choice of eating vessels. Meticulously selected pieces of Mashiko, Bizen, Kutani and Shigaraki ceramics are used to enhance the minimalistic dining experience. Even the hand-crafted Ojiya Chijimi kimonos the chefs wear was specially chosen for their superb quality and artisan roots. 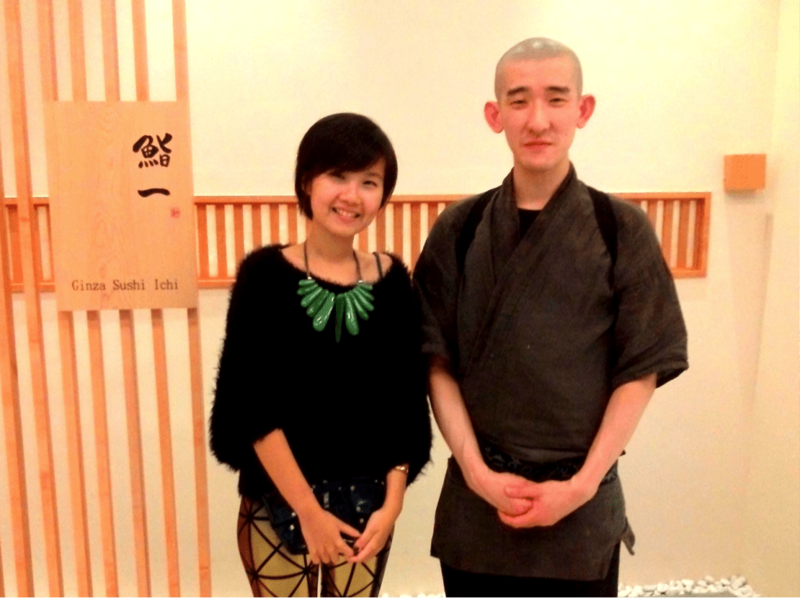 Having a Kaiseki meal (traditional multi-course Japanese dinner) at Sushi Ichi is a multifaceted, visual experience. 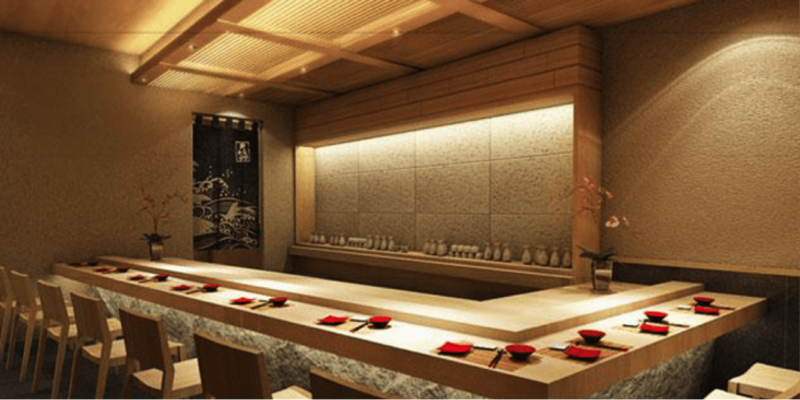 It combines the sushi chef’s artistry, with zen furnishings such as Noren curtains, which add to the quaintness of the place. At Sushi Ichi, the belief is that eating instruments brings out the beauty of the cuisine. Worth a mention is the chopsticks holder, which are exclusively created for Sushi Ichi and embellished with little details such as a sprig of flower in the chopstick holder. Unlike the outlet in Japan, where the chopsticks are hexagonal in shape and made of Japanese cyprus, the chopsticks used in the Singapore branch are the ‘hawker-centre type’ ones which served the purpose but slightly marred the otherwise immaculate experience. This restaurant can only accommodate 24 people at once, so be sure to make a reservation. Our chef for the night was Kimuya Tomoo, who was attentive and friendly. To improve your sushi experience, it is important to develop a good relationship with the chef by engaging the chef during your meal. Since we are not fluent in Japanese and can only exchange minimal English words with the chef, we had to shower our attention on him in various other ways. The best sushi experience will only be attained when you are able to trust the chef to know what you like, to be familiar your pace of eating, and the way to prepare each dish to suit your tastebuds. Ingredients are imported four times a week from the famous Tsujiki market in Tokyo to ensure freshness. For Sakizuke (‘starters’), we had cold chawanmushi with crab meat, bamboo, tofu skin in a jelly broth. The chawanmushi was silky, the crab meat and bamboo were not overpowering, and the jelly broth it was in gave it a refreshing touch. The second course, Hassun, set the seasonal tone with cold prawns and seasoned brinjal as side dishes. Next up, was Mukōzuke or the ‘Garden of Earthly Delights’ as I would like to call it. 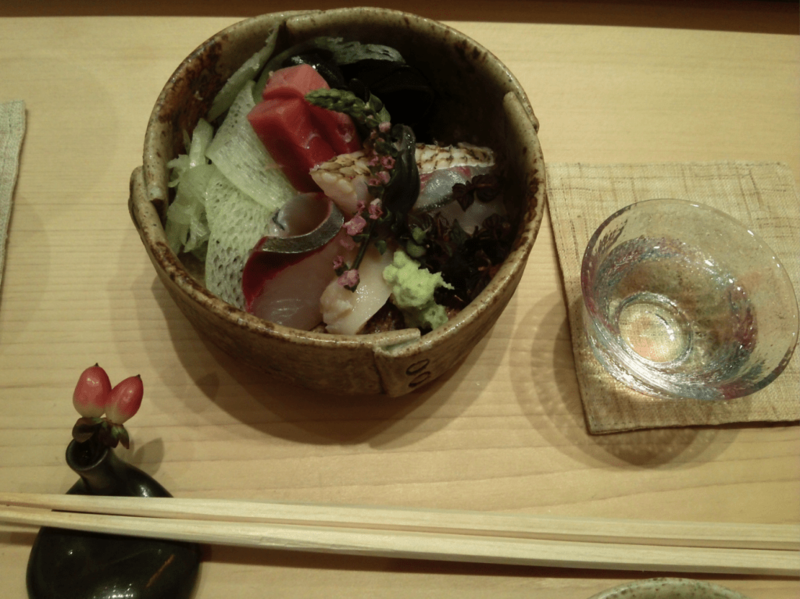 Pieces of sashimi were masterfully cut and paired with heaps of seaweed and other vegetables. Everything in this bowl was edible, down to the last flower bud which made it particularly enjoyable. The slabs of Awabi (‘abalone’) served with sea salt on the side, was succulent and its freshness was literally bursting with every bite I took. Purists would love this dish that is layered with moist, bright orange morsels of Uni (‘sea urchin’) which explodes in your mouth into a wave of custard-like creaminess. 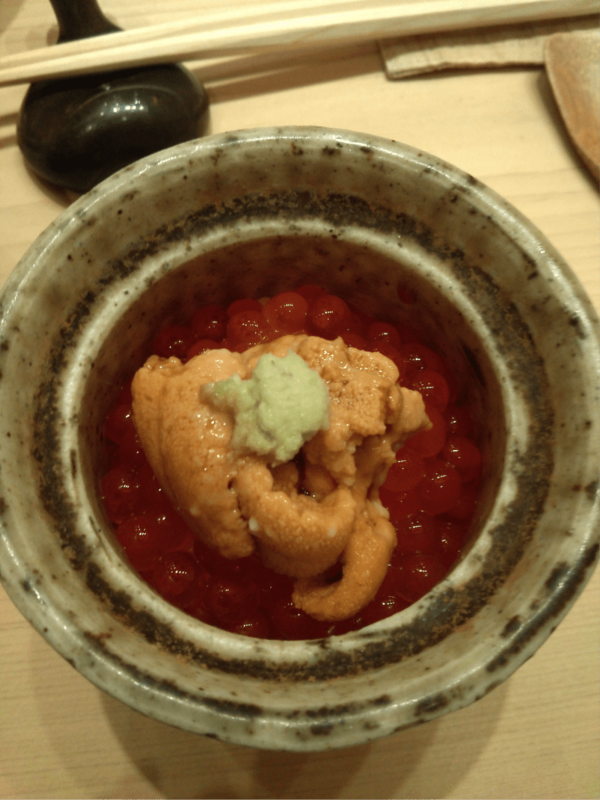 The Uni was well-balanced with the glistening balls of juicy Ikura (‘salmon roe’), with a dash of freshly grated wasabi as seasoning. The Uni offered to us was of the highest grade – firm texture and a bright yellow. This is contrasted with the lower grade Uni that is a muted yellow. Uni has a refreshing, sweet, somewhat briny flavour and is labelled as an aphrodisiac by some. A reason why Uni lovers are so compelled to order it repeatedly could be due to a “euphoria-causing chemical” ingredient (anandamide, albeit in very small quantities) similar to what you find in cannabis. Rich in protein and fibre, it is also a healthy source of Vitamins A & E, iodine and calcium which promotes good blood circulation. When Anthony Bourdain visited Sukiyabashi Jiro (touted as one of the best sushi bar in the world), he explained that the difference between “utility sushi” and “perfection” is “ingredient, technique, and timing.” Sushi Ichi scores pretty high on this scale as its chefs are not content with serving regular sushi items, and actually take the trouble to source out rarer fish not normally found in local supermarkets. 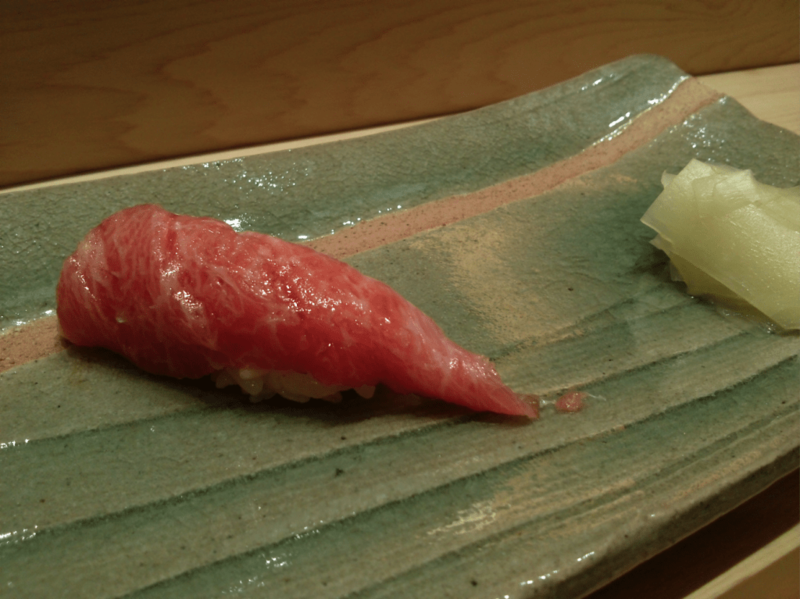 The Otoro sushi (bluefin tuna belly) was the highlight of the many Nigiri sushi (“hand made” sushi) we had that night. The Otoro served was a seductive pink and exquisitely marbled. It charmed us with its fatty tissue from the belly that gives rise to a distinctive, rich and invigorating experience. Often the unique and delicious taste of Otoro charms the majority of people as soon as they sample it. The Japanese tuna directly purchased from Hicho which is ranked in the top 5 at Tsukiji Market. The chef carefully selects rare, wild Japanese tuna and always ensures the product is of the highest quality. Sushi Ichi has a strict selection for purchasing sea-urchin, which must be purchased at the first auction of that day. The concept of ‘timing” is simple, it must be at the optimal state of preparation. This is why being seated at the counter seat is recommended as the sushi is served to you right after it leaves the chef’s hand. To this end, techniques like adjusting the seasoning or pressure when making sushi helps when the chef is aware that the sushi will not be eaten immediately. The last Nigiri sushi served before dessert is worth a mention. 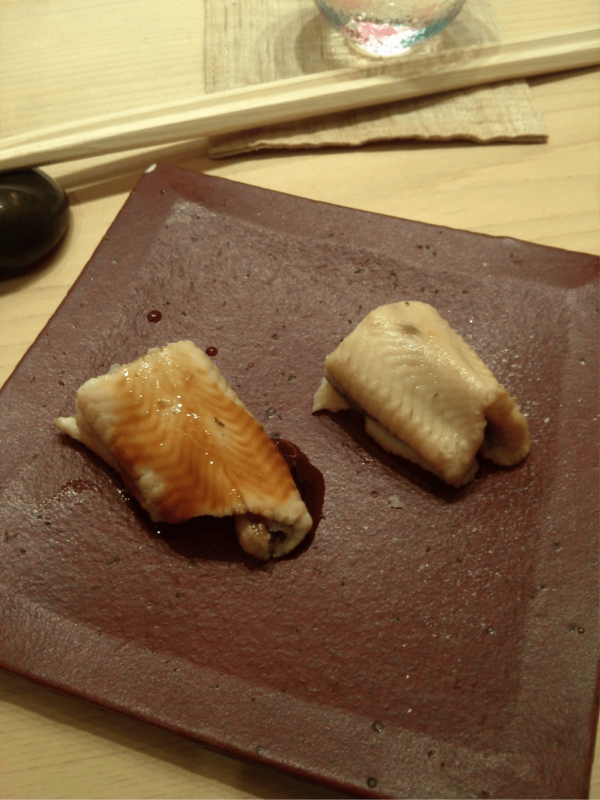 It was two pieces of Anago (conger eel) served with tangy, sweet sauce. The temperature of all the sushi rice that night was at room temperature and was perfectly moist. Also, the progression and pace of the meal was just right. Light choices such as Chawanmushi and the ‘Garden of Earthly Delights’ were presented in the first movement. The second movement had fresh catches and rarer finds like the Otoro and Uni with Ikura. The third movement was rounded off by a modicum of improvisation, where the dessert was served. 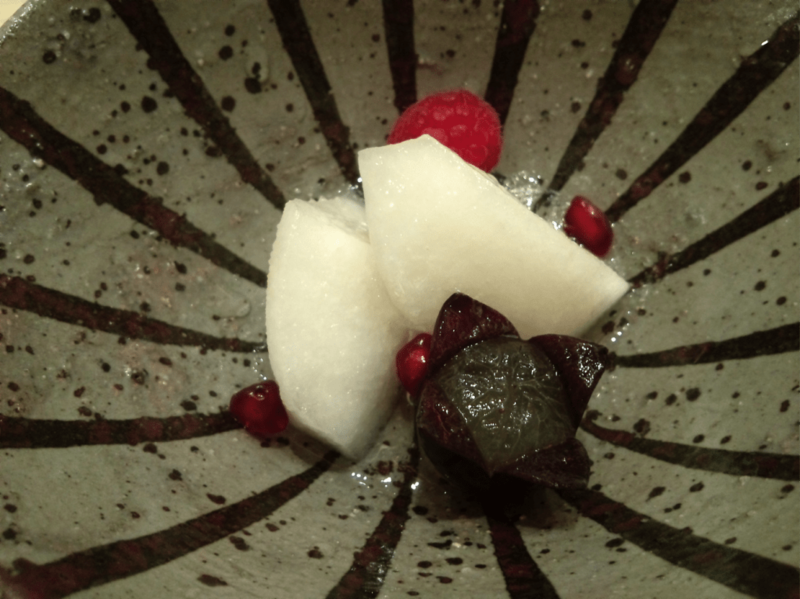 The Mizumono (‘Dessert’) offered was sweet, cut pear paired with berries and a nicely presented grape. In addition to the dessert offered in the set, we ordered a scoop of handmade maccha (‘green tea’) ice-cream which was extremely flavourful. Sushi Ichi’s dinner sets range from $210 – $450 per person, and it comes with an appetizer, nigiri sushi, miso soup and a dessert. Lunch sets start from $60 – $250. Prices vary depending on the type of sushi and quantity of assorted dishes and nigiri sushi offered. This review was done independently, Popspoken has no affiliations with Sushi Ichi or related companies.